New! 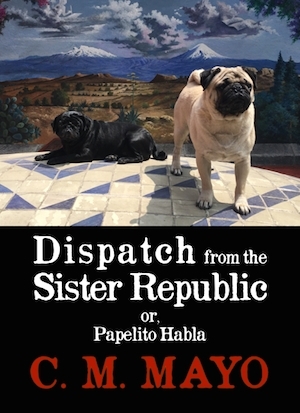 "Dispatch from the Sister Republic or, Papelito Habla" a longform essay about the Mexican literary landscape and the power of the book. Reconsidering Agustín de Iturbide and the question of what it means to be Mexican. Read the prologue in English or in Spanish. An essay about the consequences of writing a novel with a character based on Maximilian von Habsburg. In both English (Catamaran Literary Reader, summer 2017) and Spanish (Letras Libres, junio de 2017). An excerpt from a longer forthcoming essay, "Disptach from the Sister Republic or, Papelito Habla." Madam Mayo blog, April 3, 2017. An excerpt from a longer forthcoming essay, "Disptach from the Sister Republic or, Papelito Habla." Madam Mayo blog, March 20, 2017. On Writing About Mexico: Secrets and Surprises. Transcript of my talk for the panel "Translating the Other Side," American Literary Translators Association, Tucson, Arizona, October 30, 2015. And now for something esoteric and yet vital to understanding the Mexican Revolution... Excerpts from Spiritist Manual, the secret book by Francisco I. Madero, Mexico's "Apostle of Democracy," leader of the 1910 Mexican Revolution, and President of Mexico from 1911-1913. To Remember, to Understand: On Researching and Writing The Last Prince of the Mexican Empire. Transcript of my keynote for the Board of Directors meeting of the Harry Ransom Center University of texas Austin, April 22, 2010. Bahía de los Angeles: Bay of Angels: a complete chapter from Miraculous Air: Journey of a Thousand Miles through Baja California, the Other Mexico by C.M. Mayo (originally published in Southwest Review). Tijuana: A Touch of Evil: complete chapter from Miraculous Air, originally published in Fourth Genre, winner of the Lowell Thomas Award for Best Cultural Tourism article. For an introduction to Mexican literature: The complete preface to C.M. Mayo's Mexico: A Traveler's Literary Companion, a portrait of Mexico in a collection of 24 Mexican writers on Mexico many translated for the first time, including Agustín Cadena's short story, "Lady of the Seas." (also available to read on-line). Reviews include Sergio Tronoco's Crossing Borders, Sam Quinones' True Tales from Another Mexico, and Mary Jordan and Kevin Sullivan's The Prison Angel. Reader's Guide to The Last Prince of the Mexican Empire, by C.M. Mayo, an epic novel based on the true story of Agustín de Iturbide y Green in the court of Maximilian von Habsburg. Named a Library Journal Best Book of 2009. An article by C.M. Mayo originally published in Inside Mexico, March 2009. 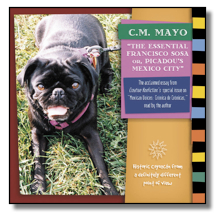 The Essential Francisco Sosa or, Picadou's Mexico City, an award-winning long essay originally published in Creative Nonfiction, now available as a CD from CDBaby.